Don’t ask us why, but artificial grass is one of the easiest and fastest kinds of sample to obtain. It’s designed to replicate real grass and there are a great many companies out there competing against each other to offer their product to you. Below are two artificial grass samples which we have featured on our website, but there are plenty more to be found with a simple Google search. You must be thinking, ‘what use are fake grass samples to me if I’m not planning to landscape my garden or cover a football pitch?’ Well, we think fake grass has almost infinite potential for arts and crafts projects. Below are a few suggestions for projects you can try. Embellish a doll’s house or create accessories for your home. With the help of Pinterest and other similar websites, we found these clever ideas (pictured) for adding a quirky touch to your home with fake grass. The house number plaque below has simply been cut with strong scissors or shears and stuck into the mould. The beauty of working with fake grass is that you don’t notice wonky cut outlines; the fluffy grass hides all sins. The cushions requires larger sheets of fake grass, but you could still achieve a similar result with lots of small patches instead. You’d get an effect like a grassy patchwork quilt. We love the table runner. This would be a lovely touch at a wedding with a Midsummer Night’s Dream theme. Here are some home decor ideas using artificial grass. We think the flip flops (below) are a clever concept. Whether you’re inside or out, you’ll always feel grass beneath your toes! If you’re a little avant-garde with your fashion, homemade fake grass jewellery makes a quirky addition to an outfit. You could add it to earrings, headbands, necklaces, bracelets, rings and anything you can think of. 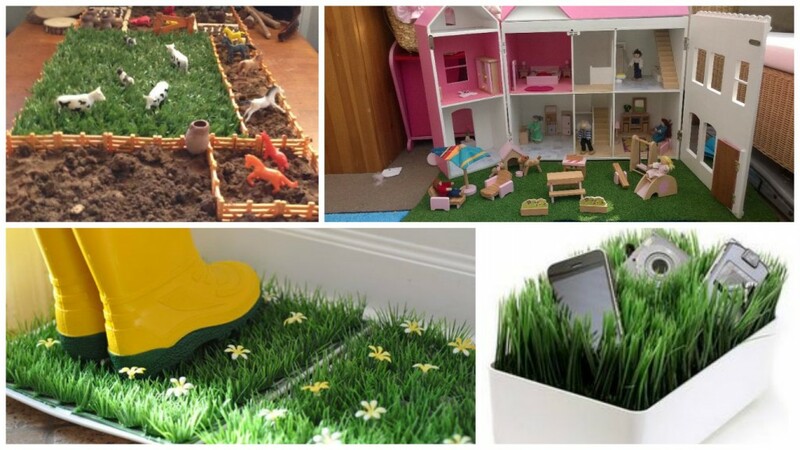 Have you tried making something with artificial grass? If not, have we tempted you to give it a try? Let us know in the comments; we love hearing from you!